Woodworking plans may call for a dovetail joint, as shown in Figure 1, without explaining how to make the joint. It is therefore important, whether you are working with free woodworking plans or those that are paid for, that you understand the complexity of the dovetail joint and why it was specified. Dovetail joints are by far, the most aesthetically pleasing woodworking joint that can be made. 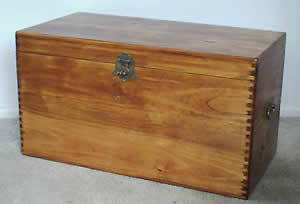 Dovetail joints have been used for centuries to make finely crafted small wood boxes to pieces of furniture. Figure 2 shows the basic construction of the dovetail joint before it is assembled. 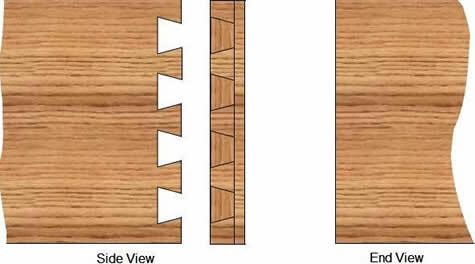 Because of its inherent pull-apart strength the dovetail joint is commonly used in post and beam construction, as shown in Figure 3. Dovetail joints have been a common method of defining a high quality item from a low quality item, especially in drawer construction. The reason being is that a properly made dovetail joint requires a lot more time to make than any other woodworking joint and if not made and fitted properly it is visually very obvious and not appealing. 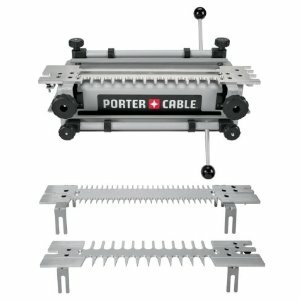 The dovetail joint never uses additional mechanical fasteners such as nails or screws to hold it together. Its interlocking fit, with some adhesives makes the joint literally impossible to pull apart in one direction, as shown with the red arrow in Figure 4, and the amount of glue surface available makes it difficult to pull apart in the other direction. 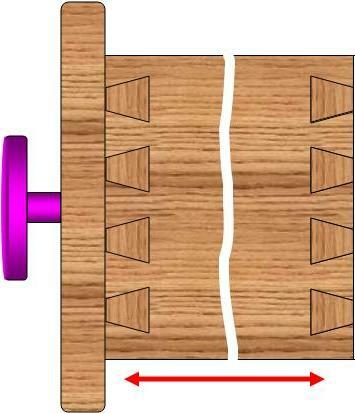 Figure 5 shows a slightly different version of the dovetail joint, known as a half blind dovetail. In the case of the blind dovetail the end of the dovetail is not visible on the back piece of wood. 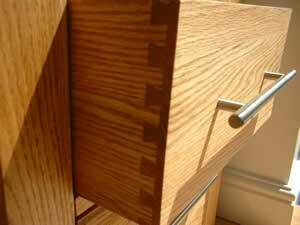 Note: It is possible to make a dovetail joint that is completely blind - cannot be seen from the side or end. However, in my opinion it is a waste of effort to make a dovetail joint that cannot be seen! There is no standard size for a dovetail joint. The more dovetails, the more gluing surface and hence the joint should in theory be stronger. 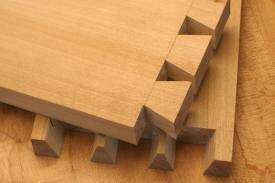 However, if the dovetails are made too small the integrity of the wood itself may be a point where the joint could fail. 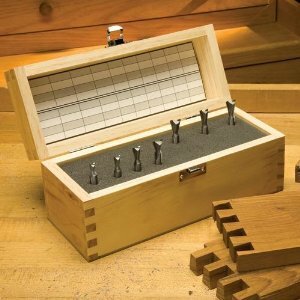 Use basic common sense when laying out the dovetail joints on your woodworking project. 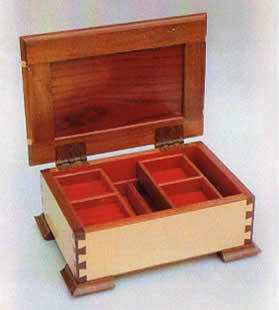 In the construction of small wood boxes, it is not uncommon to use two different species of wood, of different colors in order to actually highlight the dovetail joint. It is really the only wood working joint that adds to the aesthetics of the item. Figures 6 through 9 are examples of dovetail joints used on small wood boxes and drawers. 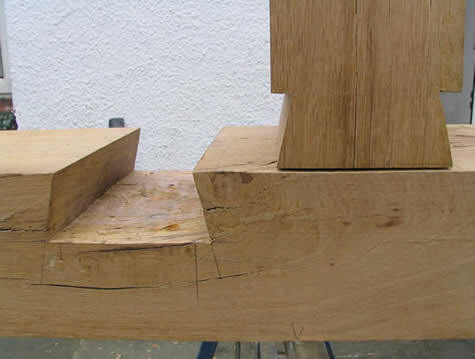 Initially dovetail joints were made by hand using a backsaw and a chisel. 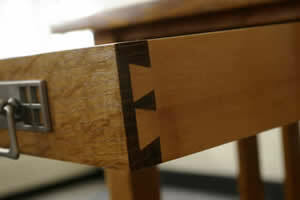 It took an expert craftsman to make a perfect set of dovetail joints. 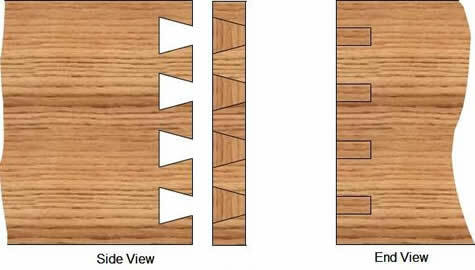 Now there are numerous dovetail joint jigs , as shown in Figure 10, and special dovetail bits made for routers, as shown in Figure 11, which allow even the novice woodworker to make expert dovetail joints and half blind dovetail joints with relative ease.